These statues offer travellers a warm welcome to Buddha Park! What's There at Buddha Park? Unlike the many temples which dot the Laotian territory, Buddha Park is unique in the sense that it does not merely depict Buddhist sculptures and structures. As the park was started in 1958 by a priest who had his own religious beliefs which integrated both Hinduism and Buddhism, the numerous statues do not merely illustrate significant characters in Buddhist beliefs including the Buddha and Guanyin but also incorporate those which originate from Hindu lore such as Shiva and Vishnu. 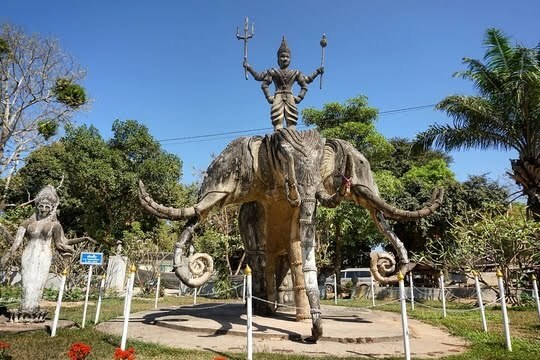 Here, you will be able to admire the interesting elements of both religions coexisting and integrating together in this same park – including the elephants worshipped in Hinduism as well as the 7-headed water serpent (naga) of Buddhism. Numerous animals like gigantic mantises and snakes are also been depicted here, but regardless of the faith, they are all shown to be subservient and submissive towards the deities who are either protected by or taking care of them. Check out this massive serpent protecting the statue of the Buddha! There are also numerous structures illustrating devout believers and followers bowing before and worshipping their gods whose omnipresence and omnipotence is ingeniously depicted through having multiple heads and facing numerous directions. This scene indeed resonates well with how the locals are revering the higher beings in the temples in Vientiane. While these statues of deities, angels and demons found all over the park may look like relics of ancient ruins, it is interesting to note that they are only 60 years old and not antique quite yet. Skilfully carved stone sculptures can be found everywhere in the park. 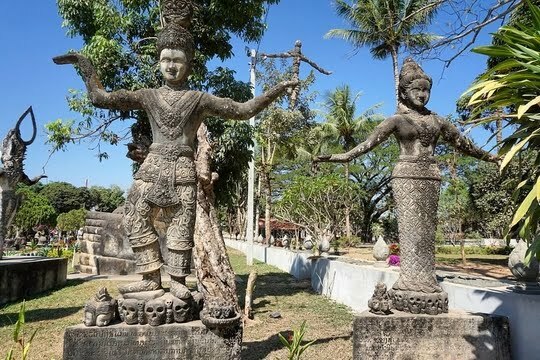 In fact, these sculptures have counterparts in the neighbouring province of Nong Khai just opposite the Thai-Lao border, as the creator of the Buddha Park fled to Thailand in 1975 out of fear for the Pathet Lao and set up a similar ‘Buddha Park’ in the opposite bank of the Mekong. The primary attraction of the Buddha Park is none other than the magnificent statue of the Buddha which is 40 metres long from head to toe. The Buddha’s reclining posture, which is extremely popular and can be found all over Laotian temples, represents his final state of enlightenment before his eventual death. This is certainly a lovely photogenic spot which you can capture the ultimate shot of the resting Buddha against the azure-blue sky. The massive statue of the reclining Buddha sits in the middle of the park. Like in many temples, there is a little stand right in front of the statue for believers to seek his guidance with regard to certain questions or worries they may have by kneeling in front of the statue of the Buddha to pray and draw divination sticks. Devotees will then give thanks by offering their worship items which they will place before the Buddha statues across the park. Some locals have made an offering to this deity - soda drinks and a straw into its nose. The most photogenic spot in the whole of Buddha Park is a stone structure which vaguely resembles a pumpkin. This sculpture can even be seen from Thailand across the Mekong River, which exemplifies just how tall it is! The pumpkin-like structure in the background offers an aerial view of the entire park. Entering the structure through the mouth of a demon, visitors receive a deafening welcome to Hell which is the ground level of the entire sculpture. They will then make their way up the stairs to the levels above that represent Earth and Heaven respectively, with each storey having intriguing sculptures and structures which are unique to its surroundings. Enter the structure through the mouth of the frightening demon! Once at the very top, one is treated to spectacular views of the entire Buddha Park and can enjoy a bird’s eye view standing above all the surrounding statues set against the backdrop of the greenery basking in the sunlight. The scene from the top - the stone statues look so small from up here! 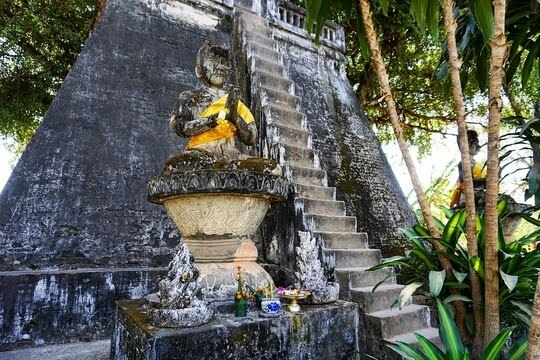 On the opposite end of the park, there is a little shrine set at the top of a three-storey high statue with an extremely long flight of stairs leading all the way to the peak. Climbing to the top also offers an alternative viewpoint where you can take in the views of the whole park as well. As the pumpkin structure is oftentimes overcrowded, it may be wise to head up to the shrine when the park is crowded and make your way to ‘Heaven’ when the massive tour groups have left. Now, let me share a word of caution. 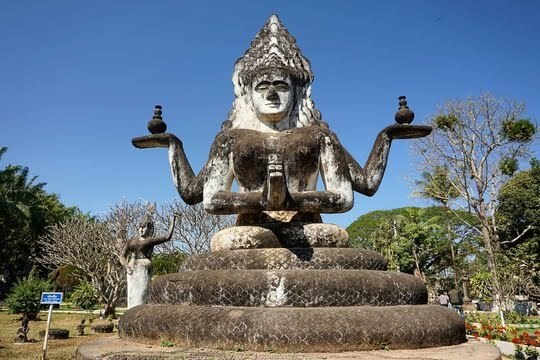 Buddha Park was the first place in Laos which led me to better comprehend what the undeveloped, authentic side of tourist attractions which we off-the-beaten-track travellers yearn so deeply for also entails. Everything here is so raw and primitive that it also means the safety of visitors is not taken into consideration during the construction and maintenance of the park. I have never seen a 3-storey climb up an extremely steep flight of stairs with no handrails to support the upper body to arrive at the little shrine. Please be very, very careful while making your way up these steep stairs! At the top of the pumpkin structure, the stone surface was so slippery that I actually saw visitors slip and lose their footing. The narrow stairs up the structure were not that simple either, as they could only fit one person at any time (so human traffic will be held up significantly) and each step saw an unprecedented elevation and steepness with no handgrips. Heading upwards was definitely much easier than descending. 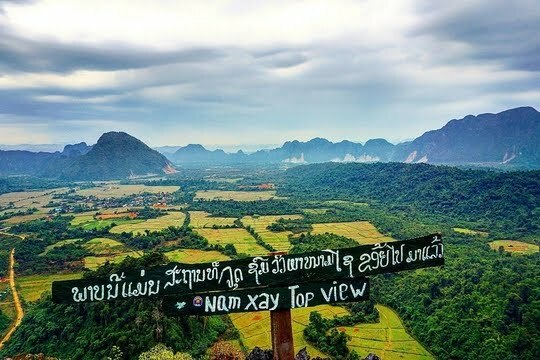 Being an acrophobic individual, I felt that it was an accomplishment over my fears whenever I complete a hike (this was just an appetiser for what I was to face in Vang Vieng), but I would like to seriously warn everyone to take good care of his/her safety especially in similar ‘untouched’ places across the globe. That said, it's the authentic places where we are able to admire these amazing relics of the past! Getting to Buddha Park is extremely simple, thanks to the comprehensive public transport system which is gradually improving in Vientiane. Simply hop onto Bus No. 14 at Central Bus Station (CBS-2) and the bus will speedily whizz you off to Buddha Park. As this service stops by the Thai-Lao Friendship Bridge which connects Vientiane and Nong Khai (Thailand), the bus is usually packed with individuals who are lugging huge baggage and crossing the border. Here comes Bus No. 14 - head on for a comfortable ride to and fro Buddha Park! Nevertheless, if you do not feel like standing throughout most of the 45-minute journey, it may be worthwhile waiting for the next bus, as Bus No. 14 plies its route at the highest frequency amongst all the services in Vientiane – once every 15 minutes. If you are entering Vientiane through the Friendship Bridge, you may wish to hop onto Bus No. 14 bound for the Central Bus Station which will make your journey to your accommodation much easier. Once you have settled in the bus, you may wish to observe as the surrounding landscape gradually changes from the urban buildings with well-paved tarred roads to the rural countryside with unmarked, sandy tracks. When the bus nears the Friendship Bridge, the conductor will start collecting the bus fare of LAK 6,000 (one way) from each of the passengers, so start getting your cash ready! 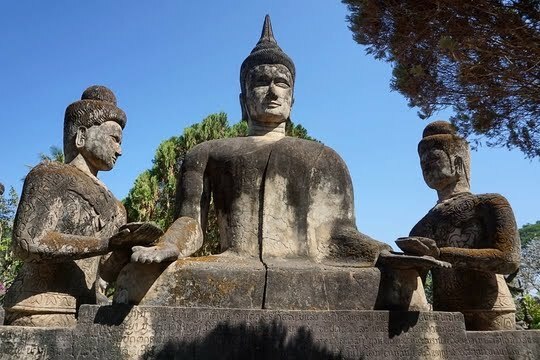 The journey will continue for an extra couple of miles before arriving at the Buddha Park where you will be ushered off the bus by the friendly conductor. 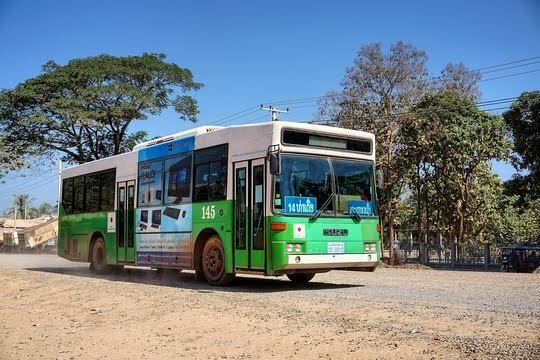 If unsure, you may wish to take reference from the Lao Bus Navi application which I have previously recommended or simply approach the bus driver who will most definitely understand you when you utter “Buddha Park”. Till we meet again, Buddha Park! After a day trip out to the outskirts of the capital of Vientiane, it's time to head back and explore some of the other sights that the city has to offer. As Buddhism plays a pivotal role in the society of Laos, let's check out some of the amazing temples which boast spectacular architecture. We will also be stopping by the COPE Visitor Centre where we will find out more about the damages that the Secret War in the previous century dealt to the entire nation of Laos. Stay tuned! Are you inspired to visit Vientiane after reading this post? If so, please feel free to check out the affordable flight options which have been made available by Skyscanner in the link below. Download the Skyscanner app on your mobile device to have a one-stop station to compare airfares from the various airlines available! It also offers car rental, travel agent and accommodation in various travel destinations including Laos. I never heard of Buddha park but this park looks interesting. I loved all Buddha sculptures in an open park and also Hinduism is incorporated in this park with statues of Vishnu and Shiva which makes it more worth visiting for me. Statues of Shiva and Parvati outside the pumpkin like structure are beautiful. I would definitely visit this place which have ancient relics from Hinduism and Buddhism. Hi Yukti, Buddha Park is definitely another relic testament to the fact that Vientiane (and Laos in general) is at the cultural crossroads of numerous influences from its myriad regional neighbours culminating in the vibrant culture and heritage that lies within this capital city. Even though my home country of Singapore has oftentimes been deemed as the cultural melting pot of diverse races and religions, I have never seen anything like Buddha Park where different religions are being represented in a single monument and attraction. Hope you'll be able to visit Buddha Park soon, and I am sure you will be as amazed as I was and you'll definitely have a great time exploring the entire park, admiring the myriad stone statues of Buddhist and Hindu deities as well as mythological creatures and taking in the sights all around you. This park is truly extraordinary. I can see why that massive reclining Buddha is so popular. And I loved learning about the history of the park. I feel like I am coming to know Vientiane a lot better through your posts. Thanks Stella! I'm glad to hear that you found my post informative and interesting. 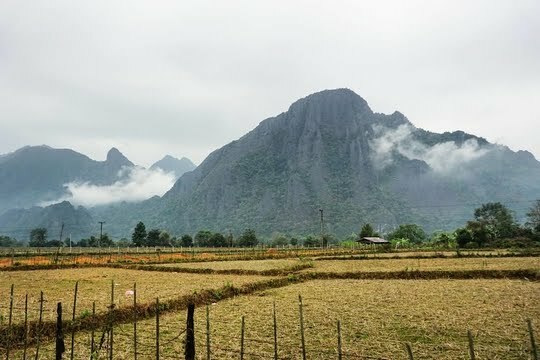 I certainly hope that by sharing these tips I have garnered during my travelling escapades in Laos, I will be able to help inspire more travellers to visit this beautiful country and assist those who are already interested to visit to plan their itinerary and route around these cities I've visited. Buddha Park is certainly an intriguing attraction which infuses vastly different cultures and traditions of Buddhism and Hinduism. However, with the sculptures of the deities and mythological creatures from the two faiths blending together in such harmony, the park seems to convey the message that the religions may not be that different after all. Really an amazing article, you covered so much and your pictures are gorgeous! This place is very special and unique. Buddha Park looks so incredible! I've never seen so many old statues in one place, plus I'm Christian, and totally unfamiliar with these statues and the stories behind them. Great tips too on being careful around the structures, and for the bus ride. Would love to visit one day. Hey Lisa, Buddha Park is absolutely amazing and I highly recommend that visitors to Vientiane do not miss this spectacular attraction which I really enjoyed. 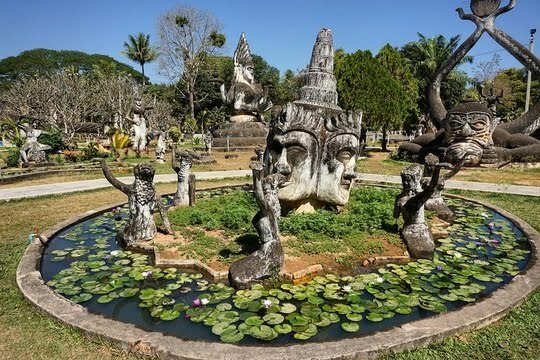 Despite its name, this park has clearly depicted sculptures and statues of myriad deities and mythological creatures from various folklore and religions of Buddhist and Hindu origins. Placing them in such close vicinity of one another definitely presents us with the sense of a certain harmony between these two races - that the priest who constructed the park seems to be conveying. The bus ride certainly made visiting Buddha Park much more convenient, especially since it's just a direct route from the heart of Vientiane. Hope you'll be able to visit soon when you're in the area to admire the gorgeous statues and soak in the ambience - I'm sure you will enjoy yourself tremendously and learn a lot about the local culture from this park! I've been to Vientiane, but we didn't get to visit this place! It's very interesting to see the Buddhas in different shapes and sizes. Great to hear that you have visited Vientiane and Laos before! This country is a severely underrated travel destination in the region which has so much to offer - rich culture and heritage, stunning natural landscapes, amicable locals and an authentic travel experience. I certainly hope that you enjoyed your stay in this country which has moved up to one of my favourite travel destinations of all time. 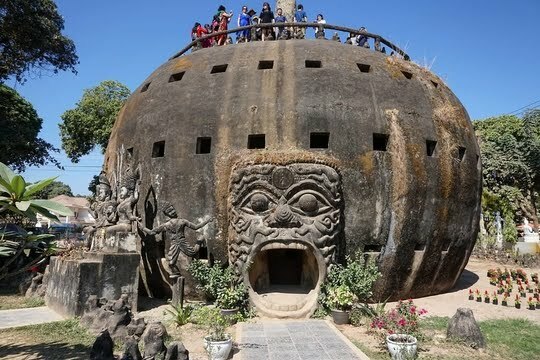 No worries about not having visited Buddha Park during your stay in the sleepy capital of Laos. I guess that gives you a sense of motivation of wanting to visit the country again to check out various attractions you have not had the opportunity to visit during your previous vacation there! Depicting the deities and mythological creatures of both Hindu and Buddhist origins together in peace and harmony here is certainly a unique and lovely sight. Hi Patricia and Miguel, I've just read up about the Buddha Eden Park and it looks absolutely amazing! I would not have thought that Portugal would have such an Oriental, Asian attraction but it certainly is worth a visit when one is in the area. Portugal is also one of the more underrated travel destinations in Western Europe which I would love to travel to indulge in the spectacular natural landscapes, learn more about the local culture and try local fare. 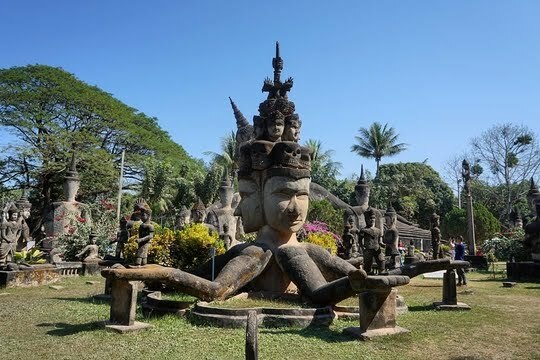 I guess the difference between the two attractions is that the Buddha Park in Laos has actually infused Hindu and Buddhist elements together in the park, while the Buddha Eden Park focuses more on only Buddhist statues and structures. Nevertheless, they are quite similar in terms of the beauty of the sculptures - and they're both about an hour outside of the heart of the capital city. Coincidence or what! This park looks like just the place we would love to visit and enjoy. Thank you for taking us through the park with your beautiful pictures. Thanks Pujarini for the lovely comment! Buddha Park is absolutely fascinating and one of the most unique attractions I have ever visited. Not only was it one of my first encounters with 'authentic' travel, the landmark cleverly infused elements from Buddhist and Hindu folklore and beliefs to create an area where these vastly different faiths seem to coexist in harmony. Even though my home nation of Singapore is often dubbed as the cultural melting pot where various races and religions coexist together peacefully, I've never seen anything like this before. Hope you'll be able to visit soon when you're in the area to admire the gorgeous statues and soak in the ambience - I'm sure you will enjoy yourself tremendously and learn a lot about the local culture from this park. Safe travels! These statues are amazing! I have never seen so many in one place and the surrounding parks look like a wonderful place to wander and explore. Hi Perri, my sentiments exactly. It almost looks like a stone maze reminiscent of Easter Island with numerous statues all over. 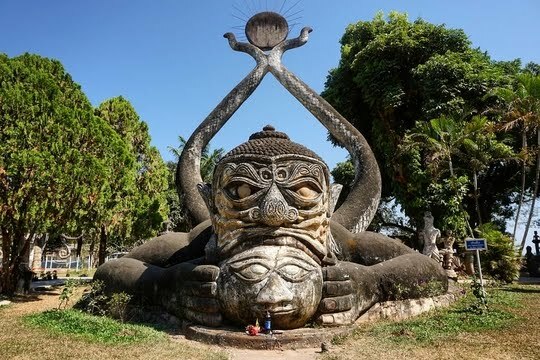 However, Buddha Park seems to convey the message that vastly different religions can coexist together in harmony, just as the Hindu and Buddhist sculptures of deities, demons and mythological creatures are side by side in this area together. This park is a great place to just slow down and admire the gorgeous statues all around. Though they may not be as old as they look, the structures certainly each have a story to tell and will not fail to introduce you to the local culture and traditions that are unique to Laos. I'll highly recommend that visitors to Vientiane not miss this spectacular attraction just in the outskirts of town that can be accessed easily. Hey there! 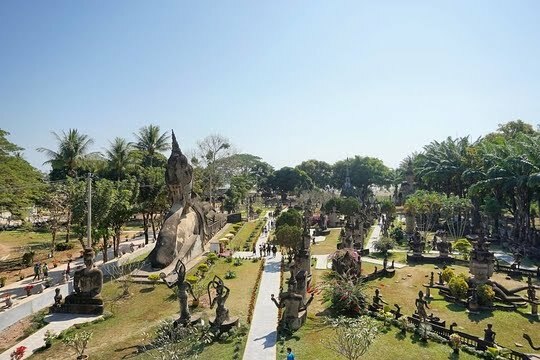 Buddha Park is definitely another relic testament to the fact that Vientiane (and Laos in general) is at the cultural crossroads of numerous influences from its myriad regional neighbours culminating in the vibrant culture and heritage that lies within this capital city. Even though my home country of Singapore has oftentimes been deemed as the cultural melting pot of diverse races and religions, I have never seen anything like Buddha Park where different religions are being represented in a single monument and attraction. 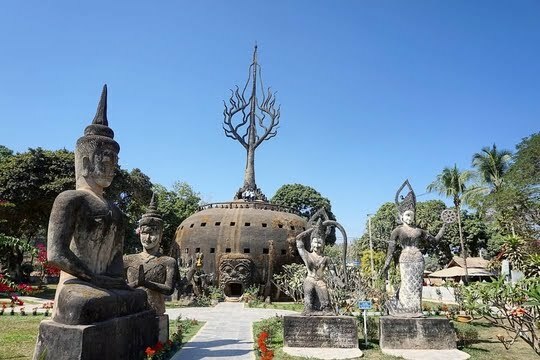 Hope you'll be able to visit Buddha Park soon, and I am sure you will be as amazed as I was and you'll definitely have a great time exploring the entire park, admiring the myriad stone statues of Buddhist and Hindu deities as well as mythological creatures and taking in the sights all around you. Hi Heidi, Buddha Park certainly looks otherworldly with these enormous stone statues depicting deities, demons and mythological creatures from both Buddhist and Hindu beliefs. If a traveller visits the park without reading up, he/she may actually think that they are all Buddhist statues as suggested by the landmark's name. This further justifies the fact that these statues, albeit from different faiths, seem to coexist in perfect harmony which is quite a spectacle. No worries, it's not Photoshop - so feel free to check out this amazing attraction when you're in the area to admire the gorgeous statues and soak in the ambience - I'm sure you will enjoy yourself tremendously and learn a lot about the local culture from this park! In spite of having visited Vientiane a couple of times, I've not seen the Buddha park, primarily since I was always busy with work when in Vientiane. The place does look amazing and your photos capture the essence of the place. It is a good reason to go back. 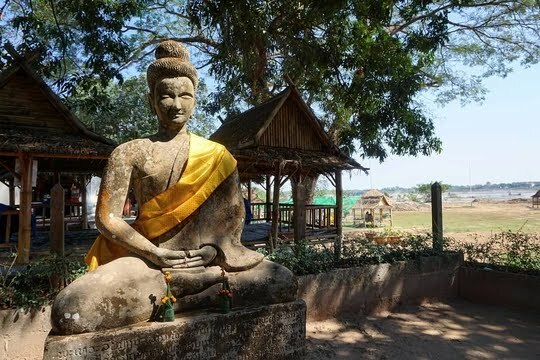 Hey Denny, I absolutely understand - Buddha Park is probably one of the attractions which is furthest away from the city centre of Vientiane which can be difficult to get to since you probably had limited free time to explore the city after completing your work. Nevertheless, be assured that Bus No. 14 makes it very convenient and accessible to arrive at Buddha Park from the Central Bus Station in the heart of the capital. Thank you for your lovely comments - great to hear that you're interested to return to Vientiane to visit various attractions which you didn't have the opportunity to visit during your business trip. 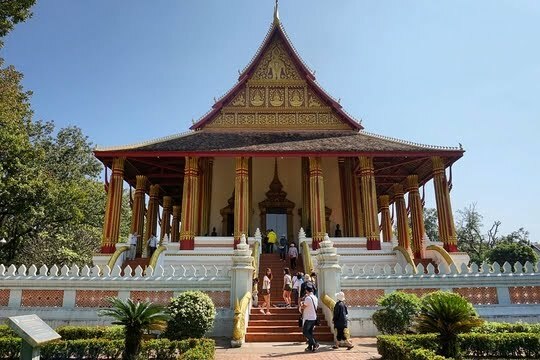 Having the chance to slow down your footsteps to explore the city and travel to these landmarks which are on the outskirts will definitely enrich your experience here in Laos and allow you to better comprehend the local culture. Safe travels! Most definitely! Buddha Park is a great option for a day trip to escape the capital city of Vientiane and just relax in the outskirts of the town. If travellers are tired of strolling around the park, they have the option of having a local meal or refreshments at the food kiosk near the river bank. Alternatively, they may wish to just enjoy the breeze and glance over the Mekong to take in the sights of Thailand just across the river. The essence of the park lies in these unique-looking stone statues that each have a unique story to tell - be it of Buddhist or Hindu folklore. Coexisting together, the park seems to be spreading a message of peace and harmony amongst the different religions and faiths. I'm sure you'll enjoy exploring this amazing place and learning more about the local culture through admiring the gorgeous stone sculptures. Do check it out when you're in the area! Hey Claire, great to hear that you're interested to visit after reading my post. It is definitely another relic testament to the fact that Vientiane (and Laos in general) is at the cultural crossroads of numerous influences from its myriad regional neighbours culminating in the vibrant culture and heritage that lies within this capital city. Though I live in Singapore which has oftentimes been deemed as the cultural melting pot of diverse races and religions, I have never seen anything like Buddha Park where different religions are being represented in a single monument and attraction. 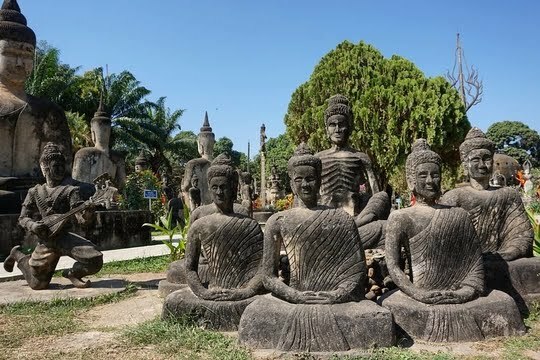 Hope you'll be able to visit Buddha Park soon, and I am sure you will be as amazed as I was and you'll definitely have a great time exploring the entire park, admiring the myriad stone statues of Buddhist and Hindu deities as well as mythological creatures and taking in the sights all around you. Safe travels! Wow the park looks like worth a visit, especially where Hinduism and Buddishm both are valued simultaneously. I have seen the reclining Budha sculpture elsewhere but never knew its true hidden value, but thanks to you now I do know. Hopefully I will get to see this park myself one day. Hey there! Great to hear that you've learnt something new from reading this post of mine. I was actually unaware of the significance of the reclining Buddha statue, but I was rather curious as to its true meaning after seeing innumerable sculptures of the deity in this reclining position throughout my entire travelling escapade around Laos. This knowledge definitely helped me better appreciate the sculptures since I now know the meaning behind it. The representation of the different religions seemingly as equals and coexisting in harmony together in a single landmark certainly spreads this message of peace amongst myriad faiths. Hope you'll be able to visit Xieng Khuan really soon to take in the sights and sounds for yourself - I'm sure you will enjoy yourself and gain insights from your visit here. I've been hearing so much about Vientiane lately. I definitely need to add it to my bucket list. The buddha park looks really amazing. I love all the different sculptures and really enjoy when they are in an open environment where you can walk through and reflect on them in nature. Hey Lynne, Buddha Park is a great option for a day trip to escape the capital city of Vientiane and just relax in the outskirts of the town. The essence of the park lies in these unique-looking stone statues that each have a unique story to tell - be it of Buddhist or Hindu folklore. Coexisting together, the park seems to be spreading a message of peace and harmony amongst the different religions and faiths. If travellers are tired of strolling around the park, they have the option of having a local meal or refreshments at the food kiosk near the river bank. Alternatively, they may wish to just enjoy the breeze and glance over the Mekong to take in the sights of Thailand just across the river. 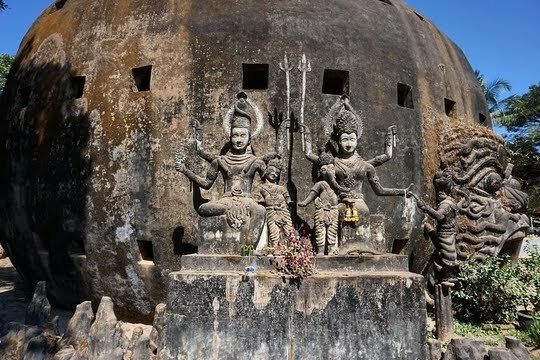 I'm sure you'll enjoy yourself tremendously here - so do check out Vientiane and Laos as potential travel destinations (they are so underrated)! Hey there, great to hear that you're inspired and interested to check out Buddha Park when you are in the area. It is really easy to get to from the city centre of Vientiane or even from the Friendship Bridge (if you are coming from Nong Khai, Thailand) via bus, so do check it out! The park also offers views of the Mekong and even allows you to check out the Thai side of the river, which was quite a cool experience for us. All the structures here look supersized and tower over us which further accentuates the beauty and reverence the locals treat these deities with. The demon face definitely looks quite frightening on first glance, but it offers a fantastic vantage point to admire a bird's eye view of the entire park, so do not miss it when you're visiting. Be careful when ascending to the peak as it can be quite steep and dangerous! Whoa, this park is pretty rad! We've got something similar in Salt Lake City, but not to this extent. I love the leaning/reclining Buddha statue and can see why it's one of the more popular statues. Even though you say the staircases up to the top of the shrine are steep and long, that viewpoint makes it worth the trek! 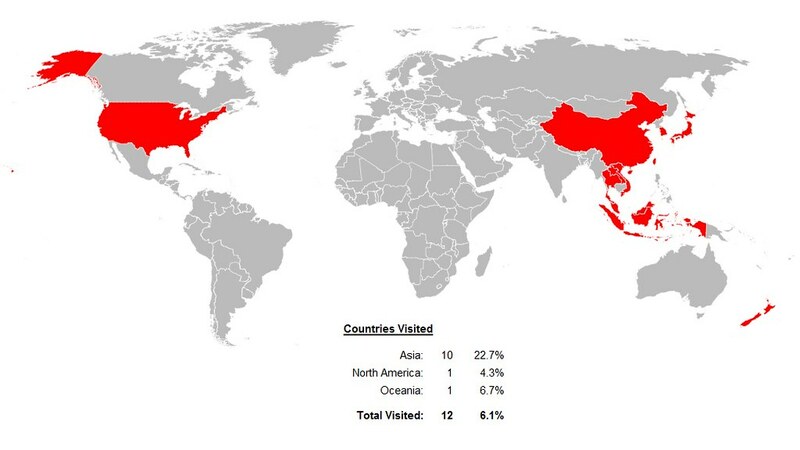 Hi Rachelle, it's interesting to hear from you guys about various renditions of Buddhist statues and parks which have permeated the world and made their marks in different countries. I'm sure the one in Salt Lake City must be a spectacular shrine in its own right as well. The reclining Buddha here is undoubtedly the highlight of the park, given its ginormous size that seems to tower over all of us who were there. I can't stop looking at all the faces in the statues! I haven't heard of Vientiane before. I'd totally explore this Buddha park. What a unique opportunity! Hi Marcie, Buddha Park is certainly an intriguing attraction which infuses vastly different cultures and traditions of Buddhism and Hinduism. However, with the sculptures of the deities and mythological creatures from the two faiths blending together in such harmony, the park seems to convey the message that the religions may not be that different after all. I was also extremely excited and scampered around to admire all the gorgeous statues. You should definitely check out Laos as it is such an underrated travel destination in the Southeast Asian region. Besides rich culture and heritage here in Vientiane and further up in Luang Prabang (UNESCO World Heritage Site), the country also has picturesque natural landscapes in more rural areas like Vang Vieng in the north and Si Phan Don (4,000 Islands) in the south. Amicable locals notwithstanding, Laos has one of the most authentic travel experiences to offer visitors, unlike the prepackaged, overly commercialised tourist attractions in many other countries. I'm sure you'll love it here! It is so amazing to see similarity with Indian idols in so many of these sculptures. Totally love the reclining Buddha statue. No wonder it is so popular. Hi Ketki, Buddha Park has cleverly infused Buddhist structures with Hindu statues of deities, demons and mythological creatures. Therefore, you may have spotted some Hindu idols on display here in the park as well. Probably, having this prior knowledge of the deities being depicted in the sculptures will further enrich your trip to this marvellous landmark. The reclining Buddha here is undoubtedly the highlight of the park, given its ginormous size that seems to tower over all of us who were there. This further accentuates the reverence that the locals accord to the deity as it shows how omnipresent and omnipotent the Buddha is. Be sure to check this highlight when you're in the area! Never knew Vientiane had so many cool spots. I definitely misjudged this city at first. Hey Eli, Vientiane is really home to rich culture and history which has manifested as a result of the fusion of numerous external influences such as regional neighbours like Siam and the 70-year French colonial rule. As a result, it is probably similar to Saigon in Vietnam in terms of the architecture to expect and this sense of cross-cultural experience. I know that many backpackers prefer to totally skip Vientiane and just head off to the countryside in Vang Vieng and Luang Prabang. However, I would recommend taking the opportunity to slow down and acclimatise oneself to the relaxed pace of life here in Laos while exploring the majestic national monuments and learning more about the local culture to further enrich the travelling journey here. Hope you'll consider visiting Vientiane and Laos! So cool! We spent one day in Vientiane a couple of years ago, and Buddha Park was one of the major highlights that we missed. If we make it back, it's on the top of the list! The statues are just so impressive, and I love the mixture of styles. 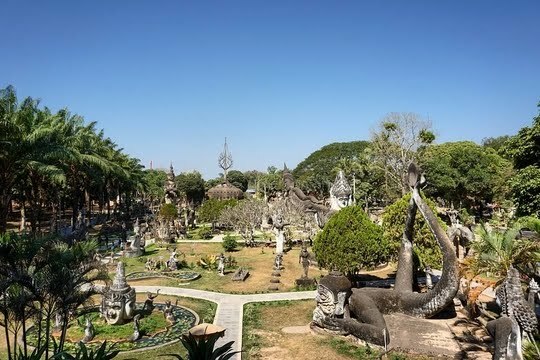 Hey Kate, it's understandable that you were not able to visit Buddha Park during your one-day stay in Vientiane as it would have minimally taken half a day to truly admire the beauty of this harmonious combination of Buddhist and Hindu relics. I would have stayed in the city to admire the other attractions in the heart of the capital, just like you did. Nevertheless, I would highly recommend that you pay the park a visit when you are back in the area as it not only offers a peaceful day trip to the outskirts of the capital where you will be able to relax and unwind but also a golden opportunity to better understand and appreciate the local culture which is pivoted primarily around Buddhist influences. I'm sure you'll enjoy it - hope you'll be able to visit soon! What an interesting place to explore! I have never seen such large statues of buddha in real life before. Some of the sculptures seem quite intriguing such as the one intertwined with a serpent! Hey Cathy, the landmark cleverly infused elements from Buddhist and Hindu folklore and beliefs to create an area where these vastly different faiths seem to coexist in harmony. Even though my home nation of Singapore is often dubbed as the cultural melting pot where various races and religions coexist together peacefully, I've never seen anything remotely similar to Buddha Park either. I especially liked the sculpture where the deity had multiple faces and heads stretching out to demonstrate that it is omnipotent and omnipresent. What is interesting about the park is also the ability to exercise your creativity to try to establish your own understanding of what the statues are trying to convey so that you are better able to appreciate each and every one of these gorgeous sculptures dotting the park. I've never seen so many Buddhas! Great tips, looks like a great day out. My favourite, as always, would be the reclining Buddhas; they are always impressive. Those steps do look rather hairy though!! Can you imagine what health and safety would say if that was in the UK!! Hi Nicola, Buddha Park is most definitely my top recommendation for a day trip out of Vientiane to the outskirts of the capital. Not only does it allow travellers to escape the city life and unwind along the Mekong, the park also presents a golden opportunity to better comprehend the local culture and beliefs since Buddhism plays a key role in the society here in Laos. What makes this park even more special is that it combines Hindu elements which was something I had never seen or experienced before. The park was definitely the first indication to me of an authentic travel experience where relics of the past are not sugarcoated and prepackaged to become popular travel destinations but instead are retained in their primitive, raw form. That is certainly part of the appeal and unique travel experience which Laos offered me - something I've never felt before. Wow! I love these fascinating statues. They really look like relics from the past, however, I'm surprised to know they are not more than 60 years old. The park looks like a lovely place to explore. The pumpkin shape structure and the concept of heaven and hell associated with it is quite interesting. Thanks for sharing the safety warnings. Hey Shaily, Buddha Park is absolutely fascinating and one of the most unique attractions I have ever visited. Not only was it one of my first encounters with 'authentic' travel, the landmark cleverly infused elements from Buddhist and Hindu folklore and beliefs to create an area where these vastly different faiths seem to coexist in harmony. Even though my home nation of Singapore is often dubbed as the cultural melting pot where various races and religions coexist together peacefully, I've never seen anything like this before. When I was exploring the pumpkin-like structure, I found the relics inside rather fascinating but was unaware of their significance. However, after learning that the different levels in the structure actually symbolised the 3 levels of heaven, earth and hell definitely allowed me to better comprehend and appreciate the message which the priest must have wanted to convey to visitors to Buddha Park. Hope you'll be able to visit soon! Vientiane looks so fascinating, I'd never heard of it before. The statues of Buddha are just incredible, really huge - I love statue and sculpture parks like these, a great use of the space! Hey Sam, most definitely - all the structures here look supersized and tower over us which further accentuates the beauty and reverence the locals treat these deities with. Buddha Park also offers a golden opportunity to better understand and appreciate the local culture by admiring the gorgeous sculptures of mythological origin and lore. Some of the locals view the park as a temple ('wat') in itself, so you will have the opportunity to observe how they worship and do their prayers to the deities, especially the huge reclining Buddha. What makes this park even more impressive and intriguing is that it has cleverly infused Buddhist and Hindu elements together to create a unique flavour which I had never seen or experienced before, even though my home country is oftentimes dubbed as the melting-pot of diverse cultures. Definitely worth visiting when you're in the area. Such a unique day trip! I really like the Buddha statue and other statues in this Buddha park. They are very different from what I have otherwise seen in the buddhist monasteries and temples. And it will be really interesting to see the fusion of Buddhism and Hinduism here. 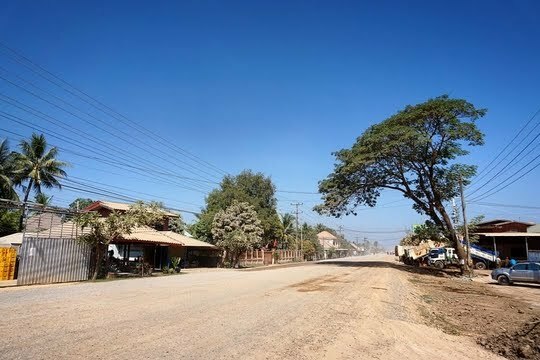 How many days , do you think, will be required to visit Vientiane and around at a leisurely pace? This is so unlike many Buddha Parks that I have seen. You are right, it does look very different from other Buddha Parks. Buddhism is a life philosophy and it's wonderful to know that As the park the priest integrated his own beliefs along with the Hinduism and Buddhism beliefs. 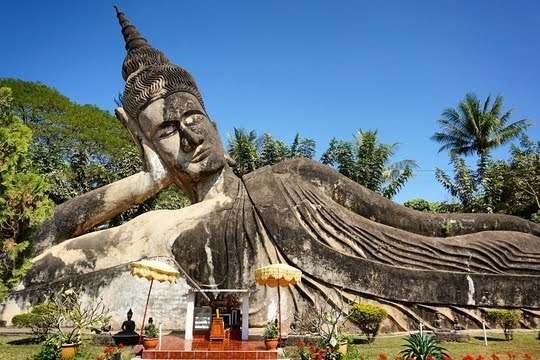 The reclining statue of Buddha is perhaps the most iconic and easily recognizable structure in Laos. I didn’t know there were so many statues in this park. My favourite is the elephant one. Being a budget traveler, I am glad to see that we can reach here by a bus. Interesting place and doesn't look so touristy. At least, it is the first time for me to see it. Good to know that it is easy to get. best article to read out the online car rental services. thanks for sharing such a wonderful blog. The online car rental and tours and travels chennai is one of the best way to learn and earn.